One morning last week, I dragged myself out of bed, filled my coffee cup, and reluctantly hit my knees to start my time of prayer and praise. Honestly, I was a bit tired and had a million concerns on my heart—in other words, I felt worried. I scrolled through the songs on my iPhone and played a recent download by Natalie Grant and the Belonging Company called, “Isn’t He (This Jesus).” I listened and focused my worship on praising Jesus Christ for His character traits. As I worshipped my worries lifted, and peace captured my heart. It’s really impossible to praise Jesus and worry at the same time, isn’t it? When I focus on His almighty nature, worries and fears seem to shrink and my faith in His goodness grows. I believe this is one of the reasons God invites us to worship Him in the first place. He is so captivating! In light of that song, I decided that over the next few weeks I’d look at one aspect of Christ’s nature each Monday on my blog. Hopefully these short blog posts will encourage your heart and help you fall more deeply in love with Jesus. The Prince of Peace is one of my favorite titles for Jesus. The prophet Isaiah first used this name for Jesus, writing, “He will be called Wonderful Counselor, Mighty God, Everlasting Father, Prince of Peace” (Isaiah 9:6). It seems we focus on this verse most often at Christmas time, but I know I need a Jesus who is my Prince of Peace all year long! What about you? I see Jesus calming the wind and waves with one rebuke(Mark 4:34-41). Jesus speaks, and instantly the sea becomes quiet and still. 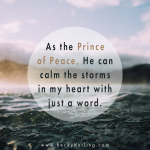 As the Prince of Peace, He can calm the storms in my heart with just a word. He is able to bring every tumultuous wave of worry to placid stillness. I see Jesus sitting by himself quietly enjoying the Father’s presence. Though the disciples are putting pressure on Jesus to get moving, Jesus doesn’t over-explain or become defensive (Mark 1:35-39). He doesn’t get frantic or frazzled. He doesn’t allow the expectations of the disciples to drive His ministry. He simply says, “Let’s go somewhere else – to a nearby village – so I can preach there also. That is why I have come.” I love this picture of Jesus because, honestly – just between you and me –sometimes the expectations of others make me feel a bit wiggy. But when I feel frantic or frazzled, I need to remember the Prince of Peace; He is ready and willing to remind me that I need to be driven by His voice alone. He is able to hush my anxiety with His presence as I do what He’s called me to do. Steve and I, our daughter Keri, and her family are in Bradford, England, visiting our team at the Millside Center. Pray that we can encourage our team while in England. Pray as we travel with Keri and Zach and their 2 toddlers, that the kids will sleep on the plane and that the trip will be a time of encouragement for Keri and Zach. Check out the video, and then would you be so kind as to help me get the word out? Thanks much! !